Several weeks after enacting the role of "Mr. Norfleet" in VAGABOND LOAFERS (1949) and a few days after portraying "Captain Daly" in PUNCHY COWPUNCHERS (1950), Emil was called for yet another role with the Three Stooges, marking his eleventh film appearance with the team and his third job in a row with the trio. 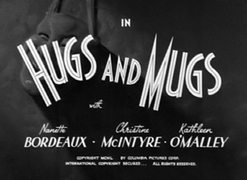 Produced and directed by Jules White and written by Clyde Bruckman, HUGS AND MUGS features a cast that includes Christine McIntyre, Nanette Bordeaux, Kathleen O'Malley, Joe Palma, Wally Rose and Pat Moran. The story is about a stolen pearl necklace that winds up in the hands of the Stooges. At the same time, the three beautiful female thieves that stole the necklace finally get of prison and when they go looking for their hidden loot they trace the necklace to the Stooges. Then they turn on their feminine charm aimed towards the Boys in an effort to locate and retake the necklace. In the meantime, several gangsters are following the ladies, and they try to move in and take the necklace for themselves. 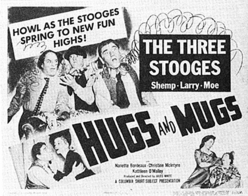 Pandemonium breaks out with the Three Stooges, the three beautiful dames, and the three thugs chasing and hiding from each other until finally Shemp finds a hot iron. by applying the iron strategically to the rear-ends of his foes, he chases them off and saves the day. 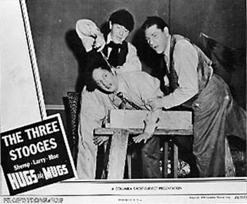 This was Emil's third consecutive film role with the Three Stooges, and at just over thirty seconds of screen time it was even smaller than the previous one, and he received no screen credit for it. Nevertheless, as always when faced with a minor bit part, Emil did his best to make the most of it. 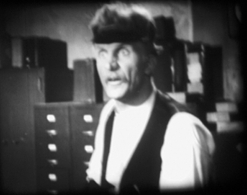 When the three lady thieves get out of prison and go to the storage office where they left the necklace, Emil plays an "old grouch office clerk" who tells them, "Your parcel was sold yesterday at auction for storage costs. It was bought by some gentlemen who own the Shangri-la Upholstering Company on Hope Street." As "Lily," Christine McIntyre reacts dramatically and protests, "You can't do that!". Looking quite grouchy, Emil replies, "I got news for you sister, I did it - and there's nothing you can do about it! Scram!" Momentarily frustrated, McIntyre gets a gleam in her eye as she picks up a fountain pen and says, "Oh, mister..."
Emil looks up, and "Lily" pulls the lever on the pen, squirting black ink directly into the middle of Emil's face. As he stammers and sputters, the ladies laugh and turn to leave in the direction of the "Shangri-la Upholstery Company." This was the last Clyde Bruckman script that Emil would work on. Previous Bruckman films Emil appeared in include BRIDELESS GROOM (1947), and THREE HAMS ON RYE (1950) starring The Three Stooges, as well as HONEYMOON BLUES (1946) with Hugh Herbert, ANDY PLAYS HOOKEY (1946) starring Andy Clyde, and ROLLING DOWN TO RENO (1947) with Harry Von Zell. 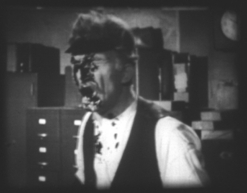 Clyde Bruckman achieved success in the 1920's as a member of Buster Keaton's writing staff, contributing to such Keaton classics as ROUGED LIPS (1923), SHERLOCK JR. (1924), and THE GENERAL (1925). He also directed stars such as Laurel & Hardy, Harold Lloyd, and W. C. Fields. 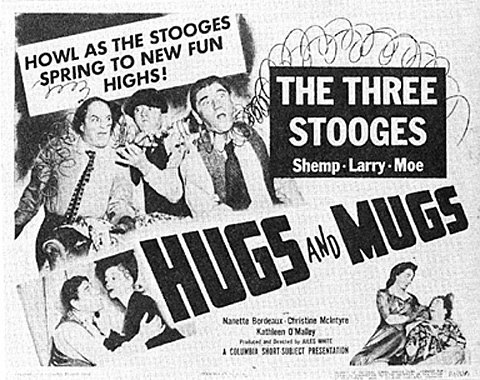 At Columbia, Bruckman penned dozens of scripts for the Three Stooges, including some of their best. By the time HUGS AND MUGS was made, though, Bruckman's career as a writer was declining, and he'd earned a reputation for re-using material from his own and others previous work. Reportedly, in 1955, despondent over his failing career, he borrowed a pistol from Buster Keaton and committed suicide. Someone posted the video below on YouTube. It includes Emil's scenes pretty early on.